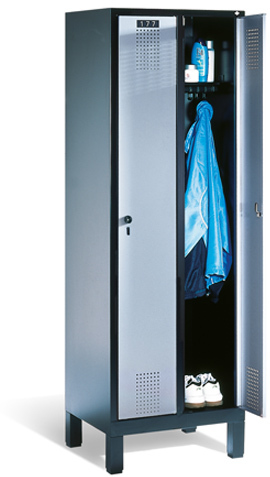 Manufactured from high quality steel, EVOLO assembled box lockers are extremely robust and compact. 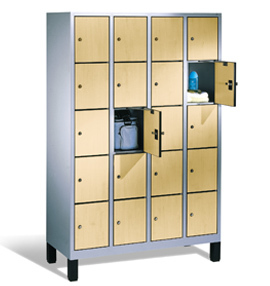 Lockers are available in a choice of 2 compartment widths as well as 5 different box heights. 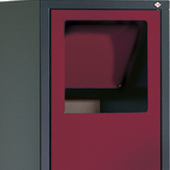 Each locker is manufactured with a special 54° design profile ensuring stability and is well ventilated through the unique Evolo Ventilation Concept (EVL). 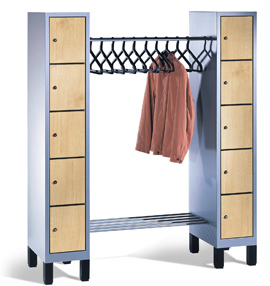 The locker interior consists of a hat shelf with robust wardrobe rail and 3 hooks with system holder that are twist-proof. It can be utilized for coat hangers or movable partitions. Doors are hinged internally, attached with doorstop silencers and the outer front panel can be changed with steel or MDF decor doors. Evolo guarantees ease of use, safety and space efficiency. The Evolo ventilation concept guarantees effective ventilation and drying of clothing. Thanks to the chimney effect, it works without any additional ventilation fittings. 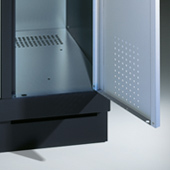 The system guarantees consistent ventilation of the entire interior, even in lockers on plinths! Evolo is up to any challenge. Locker and assembled box locker systems need to fulfil special requirements more often than you might think Evolo meets these requirements. 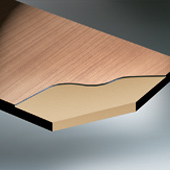 For example, its innovative exchangeable front concept that allows the use of both steel and MDF or HPL decor doors. Or the wide range of compartment sizes, bases, top units, useful add-on furniture, together with industry-specific and special solutions. You are bound to find the right solution to your requirements from among the full Evolo range. A good start to the work day. Changing facilities in industry and business – a chapter of its own! The widest range of requirements can arise, in addition to compliance with workplace guidelines: Separate storage of street and work clothing, forced ventilation, additional storage space, special hygiene regulations, or a sealed connection to the floor for mechanical cleaning purposes. Evolo’s standard range easily meets all of these requirements. And looks great, too. For use beneath the street/work clothing model (= two compartments per user). Can only be opened by the locker user. 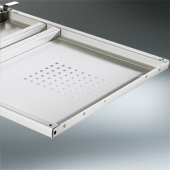 It offers formerly unutilised storage space on the inside and a stylish means of closing the gap to the floor on the outside, while at the same time considerably reducing the floor area that needs cleaning! In addition to areas requiring lockers with feet or plinths, numerous room configurations demand alternative base forms. For example, Evolo offers four integrated bench models to meet all requirements. Evolo is also ideally suited for mounting on plinths built on site (e.g. tiled brickwork). And last but not least, the variable carcass design offers a perfect basis for practical multi-purpose lockers and flexible interior fittings. In front of the locker, beneath the locker, lowered bench base, or with under-bench storage box. Laundry wardrobes, cupboards for housing cleaning equipment and storage furniture, laundry collection and distribution solutions: The Evolo range offers all of them! For easy loading of the laundry collector. Standard, with four sturdy hooks for hanging the laundry bag. 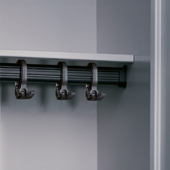 Oval profile with swivel free sliding hooks for system mounting, e.g. for coat hangers or lockable partition wall. The difference is in the detail! S 3000 Evolo offers much more than you expect. Clever and well thought through – typical CP. 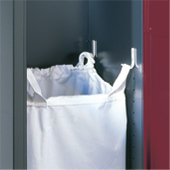 For regular use of the locker top for storage purposes. With lateral and rear limit stops. Made of anthracite coloured DCPB. 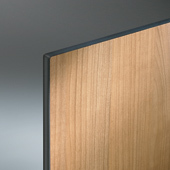 Evolo decor fronts can feature quite individual designs and not only attractive wood surfaces. 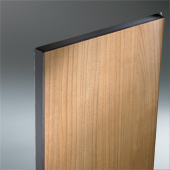 Evolo offers tasteful exchangeable decor fronts to add visual value. The doors can even be exchanged subsequently. In addition to its appearance, the programme also offers convincingly intelligent technology, such as its unique drying and ventilation concept. The Evolo series offers numerous additional options besides the classic light grey and anthracite carcass colours. Vivid or muted shades are suitable particularly as door colours or for adding colour highlights. 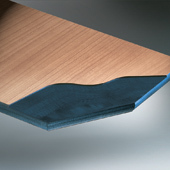 Contemporary decors are available for MDF/HPL fronts and blanking panels. Steel Doors: The standard Evolo steel doors with stop silencers are extremely warp-resistant and guarantee greater protection against break-ins thanks to the sealed profiles on the sides. They can be coated in any colour from the C+P range – special colours are available on request. MDF Doors: The optional decor doors made of MDF (medium density fibreboard) are also fitted with doorstop silencers and edged all round in charcoal. 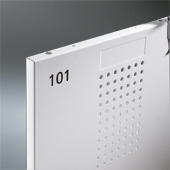 Depending on the number of lockers, many additional special decors are available, besides the attractive standard decors. HPL Doors: The top-of-the-range Evolo model is also optionally available with HPL (high pressure laminate) doors with stop silencer. 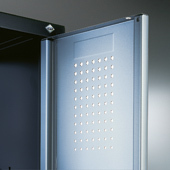 The surrounding black grey edge shows the high-compacted solidcore material of the HPL panel.